Can Etsy craft investors’ interest? 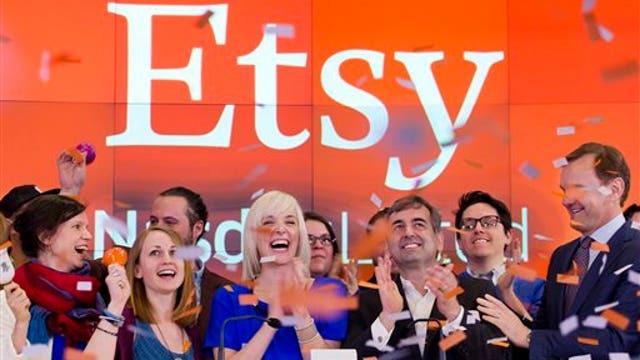 Craft marketplace Etsy debuts on the NASDAQ today. Will investors bite? FBN’s Jo Ling Kent spoke with top seller AHeirloom about the company’s crafty consumers. Shares of Etsy Inc (NASDAQ:ETSY), an online marketplace for handmade goods and crafts, more than doubled in their debut on Thursday, valuing the company at about $4 billion. The company&apos;s offering of about 16.7 million shares raised about $267 million, after it was priced at the top end of the expected range of $14-$16. "There is demand within the niche they operate in for unique handcraft and vintage goods," Wedbush Securities analyst Gil Luria said, starting coverage with a "neutral" rating. Brean Capital started with a "buy" rating, citing Etsy&apos;s "differentiated products" and popularity on social networks such as Facebook. Founded in 2005 by Robert Kalin, Etsy has grown from a website selling wooden goods to an online community offering handmade items. Etsy, which has 29 million items listed on its website, offers jewelry, stationery, clothing, crafts and home goods. The company&apos;s revenue comes from listing fees and commissions on sales and from its advertising platform, payment processing and shipping services. Etsy, whose larger rivals include Amazon.com Inc, eBay Inc and Alibaba Group Holding Ltd, had 1.4 million sellers and 19.8 million buyers as of December. The global online retail market is expected to grow about 17 percent to $1.5 trillion between 2013 and 2018, according to research firm Euromonitor. Etsy&apos;s revenue rose 56 percent to $195.6 million in the year ended Dec. 31, while net loss widened to $15.2 million from $796,000. New York-based Etsy sold 13.3 million shares, while stockholders including venture capital firms Accel Partners, Index Ventures, Union Square Ventures and Acton Capital sold the rest. Etsy is designated a "benefit corporation", which is an entity whose corporate goals include having a positive impact on society and the environment. The company has identified any loss of this status as a potential risk to its reputation. Some of Etsy&apos;s sellers have expressed concerns the website will lose its popularity as a marketplace for unique items after the company went public. "I would hate to see Etsy turn into a Google shopping that is crowded with items from China," said Kimberly Fink, who sells gift items for cancer patients on Etsy&apos;s website. Etsy&apos;s shares were up 97 percent at $31.60. The stock, which was the top percentage gainer on the Nasdaq, opened at $31 and touched a high of $35.74. Goldman Sachs, Morgan Stanley and Allen & Co LLC were underwriters for the IPO.